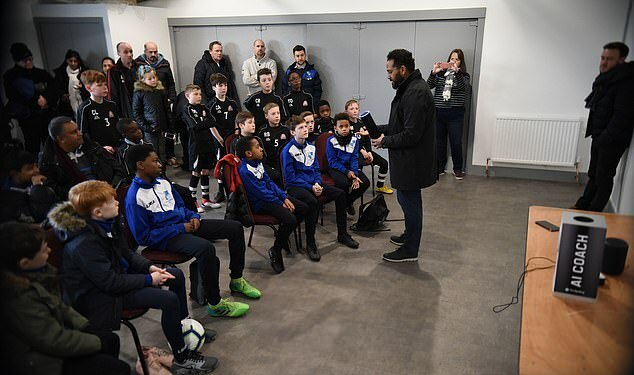 Wingate & Finchley U10, Itai showed off his skills and entered the Chelsea FC freestyle competition by sending in a video clip. His impressive array of showboating earned him an invitation to Chelsea's training ground at Cobham this week. Itai met his Chelsea heroes including Eden Hazard and competed alongside other Junior Blues at Cobham where he was declared the outright winner. A massive Congratulations for Itai from all at Wingate & Finchley - a truly memorable experience! With many thanks to the Junior Blues. 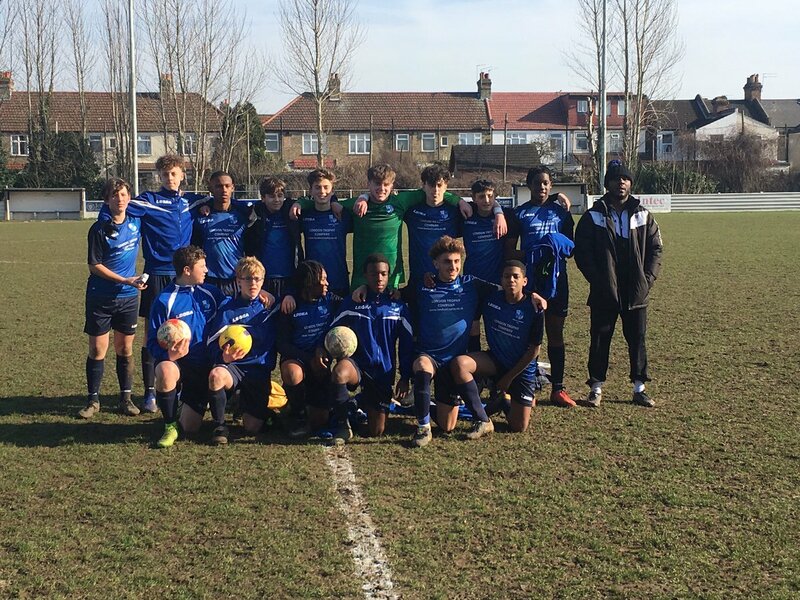 Wingate & Finchley U15s victorious campaign in the London County Cup and impressive League form earned them an invitation to Tottenham Hotspur's Academy this week. The U15 boys competed against 3 other clubs, winning all games with some stylish football. A great experience for the boys to showcase their talents as they continue their development and progression as a team under the guidance of ex Wingate & Finchley first team star Tashan Bradshaw-Brown. U7 Blue performed fantastically today. The team are learning to play the ball out from the back and matched some of the best teams admirably with some great wins. U7 White finished top in their tournament! They started slowly but were superb in their final 3 games. Roared on by Wingate Blues who came to watch the whites’ final game, Jonah was immense in defence whilst Rafi and Harry shared the goals against a very technically good team. A well organised tournament that saw the Whites have to display both grit and skill. U8 Blue showed great fighting spirit today. Ethan’s hat-trick helped the team enjoy another impressive performance as Zack & Samuel also got on the scoresheet. James and Nathan were commanding at the back as the team showed good movement off the ball and displayed some great passing against good opposition who made a real game of it. U9 Blue battled well in the middle of the park, with great possession play and sheer brilliance from Alessandro, Marc-Vincent, Albee and Caleb to link up well in midfield area with one touch pass and move. A goal from Marc-Vincent on his return gave everyone a boost in effort, energy and willingness to up their game. U9 White dominated play from start to finish with some great link up play between Zach and Ethan with two outstanding goals for Zach and cool finishes from Ethan, Cruz and Anoush. Benji also made some excellent saves and distribution was very good throughout the game with some great decision making throughout. In today's league cup, U10 White were unbeaten and didn't concede any goals in their five group matches but ended up second in their group on goal difference. The energy showed by all players was excellent. Ronnie showed great anticipation to protect clean sheets. Reuben’s well taken volleyed goal in the final game was not quite enough to qualify for the semi finals. We are pleased to announce that the youth trials for next season will be held on the May Bank Holiday weekend (4th & 6th May), for players of all ages from Under 7 upwards. Please see the registration form at this link and send any queries to trials@wingatefinchley.com. U7 Blue played a high intensity end to end game with some brilliant goals. Ollie played his first game at the back and showed how well he reads the game. Dylan got a brace and Ethan scored direct from a corner. The team continues to develop well. U9 Blue played in a tournament with a fantastic effort from all the boys from start to finish. The boys came away second! Great commitment, great football! U9 White played the league tournament today and played some great football all day. The boys did incredibly well, winning most of the games with one loss to the group winners. Outstanding all round and special mention to Benji who was incredible in goal in every match. U10 Blue capped a great team performance. The team have been working on direct through balls in training for a couple of weeks and they put it into practice brilliantly today creating lots of opportunities! Goals from Liad, Dylan and a last minute goal from Joe capping off a good performance. U10 White were involved in a dramatic but entertaining game. Ronnie showed great desire against the threat of two terrific opposition forwards. Bailey's last minute strike capped a performance full of energy and Jake inspired the teams recovery in the last few minutes of the match. U11 White had their league tournament today. The boys played some really good football throughout the day, one goal in particular was one touch football from defence to attack with just 5 passes and the finish from Angelo with a fantastic left foot! The boys showed great resilience against some of the best attacking teams with Alex, Josh and Juan defending unbelievably well. Some great individual skills from Ricco and Luke got the team in some great positions to score. Our goalkeeper, Ethan was on form off his line sweeping up a lot of long balls over the defence and Yannick was a warrior in midfield making tackles. A great learning day for the Wingate Whites. U14 put in a very pleasing display to convincingly win 6-2 against a tough opposing side. Retaining possession well and passing the ball in triangles, switching play from side to side, we made full use of the whole pitch. Goals today from Anton (2), Anthony, Will, Yoshi and one from Man of the Match - Roussard.Goals from Angelo with a fantastic left foot finish. U8 Blue produced one of their best performances of the season and stayed disciplined throughout the game. Jonah continued his rich vein of form with four goals while Nathan and Zack both showed great trickery to get on the scoresheet. James and Yash were commanding at the back and it was a real team performance. U9 Blue played against a strong side today and had a great battle. A very well disciplined performance from all today. Great composure and goals from Alessandro and Joshy (2) today. A man of the match performance from Finley yet again. U9 White played with discipline today! Their improved team communication, quicker transitions from attack to defence coupled with special performances from Zac and Benji made the game a spectacle to watch. U10 Blue played some excellent football today, the team spirit is great and the boys played more decisively in the second half. Calvin finished well with a great through ball from Liad and a spectacular goal from Leo with a couple of minutes to go. U10 White showed a great attitude and work ethic. Decision making and use of ball in posession was not consistent enough throughout the game. Rafi got both goals, the second a real strikers finish. U18s won their quarter final of the challenge cup today 4-2 to march into the semis with goals from Archie, Jack, Jacob and Carlos! U7 White played with real character, their play was intricate and most pleasingly, their decision making was superb. Daniel and Rafi stood out this afternoon as real team players. U8 Blue produced another impressive display with some excellent passing and great movement off the ball. Special mention for Yash who scored an unbelievable goal from the halfway line into the top corner. Nathan, Ethan and Zack also got on the scoresheet. U9 Blue came out today with a very impressive team performance. Great individual performance from Sami who made some vital challenges and kept the defence tight when he could. U9 White played some lovely passing football today with David scoring his first goal for the club from the penalty spot after a lovely move down the left hand side from birthday boy Tyler, proving too much for the other team to handle. Another good performance from Zach in the middle. U10 White showed good spirit and desire to work for each other, especially out of possession, typified by some tireless work by Olly. Rafi (2), Jake (2) and James scored the goals. U11 White fought really well and were rewarded with goals from Arkin and Juan. A great defensive display from the back 3 and a special mention for Angelo who was brilliant covering every blade of grass. Well done U11 Whites! U14s lost 2-0 to a strong opposition team today, showing us areas to work on in training next week. However, positive performances from Clem in goal and Yoel in defence. Under 15 boys warmed up for their London County Cup final next weekend with a deserved 2-0 away win, goal scores Dan and Georgio. The final is on 31st March at 10.15am at Fisher FC's ground. Wingate U16's had a superb game of football today against St Albans in the Chairman's Cup quarter final. The opposition took the lead from the penalty spot against the run of play and this served to spur the boys on to grab an equaliser shortly with a tidy finish by Max. Max added to his goal tally half way through the second half and the boys extended the lead to 3-1 after a cool finish from Ethan. St Albans pulled one back with 10 mins to go but the Wingate boys held on for a well deserved win! We will now play away at Witham Town in the semi final in a few weeks time, more details to follow shortly. U18 Blue played at home against St Albans, we carried on our winning run with a 1-0 victory thanks to a goal from Saul in the first half following a corner. We controlled and managed the game very well with some excellent defending. Man of the match was our goalkeeper Frankie who marshalled the defence and swept up very well at the back. Another 3 points in the bag! U18 White lost a tough county cup final 4-2 against a strong Bridon Ropes team - the boys did themselves proud but just fell short in the end. U7 Blue played a fantastic game, the team are developing a real style and the players understanding of their roles is increasing match by match. Braces from Brandon, Ollie and Jamie and a man of the match defensive performance from Jakey. U7 White played on a large pitch and were able to spread the play well, particularly in the first and third quarter. Luca played exceptionally well with some great touches around the area and created some great opportunities with his quick feet. Special mention to Theo who had his best game in a Wingate shirt. U8 White had a slow start to the first half, with Fran playing a huge part making some fantastic saves. Second half we battled hard with goals from Taylor (4) Aaryan (1) Jayden (1). Man of the match - Fran. U9 Blue set out with a different mentality of playing keep ball and using the pace of Albee and Caleb to get in behind a very organised team. A great team effort by all and some outstanding performances from James Caleb and our Man of the match Finley in goal! Great team work and very attractive football being played by the team. U9 White played some excellent football and came up against a very strong keeper today. Great goal from Anoush, some lovely play by Zach in the middle with an excellent display at left back from Cruz. U10 Blue defended well in the first half, but faded in the second half but should take encouragement from implementing some ideas developed in recent training. James showed great spirit in defence with some important tackles. U10 White played well in patches but didn't find the consistency for the whole game. Christian continued his improvement with a well taken goal. U11 had another great performance! Started really well with some great passing through the midfield. The first goal came from a free kick after some great passing in the final 3rd. Yannick crossed a great delivery to the back post where Angelo brought it down and fired home from 6 yards. The second goal came 4 mins later when a great individual run from Luke crossed a delightful ball into the 18 yard box for Daniel to meet it perfect on the volley to score a great goal. Angelo made it a brace in the second half when his left foot scuffed volley rebounded back to him on his right and he lobbed the goal keeper. A great defensive display from all the boys especially Josh who won his tackles and headers to stop waves of attacks. U16's had a high scoring draw today with the teams shared eight goals between them, with Wingate always taking the lead, only to be pegged back each time. With 1 minute to go the boys conceded a late penalty which cost them the win. The boys created a stack of goal scoring opportunities throughout but could not find the net. Goal scorers were Kieran with 2 goals, Ethan with a fantastic free kick into the top corner and Ibrahim with a clever finish from the edge of the box. Cup quarter final action for the boys next Sunday at home against St Albans. U18 Blue carried on our winning run. Dominating play from kick off using the whole width of the pitch resulted in a 5-1 win with 2 goals each from Sam and Daniel and a goal from Oliver which started the scoring following a fantastic delivery from James who went on to collect the Man of the match award following his fine defensive performance and assists for 2 of the goals. The Under 15's Cup Final this Sunday has been moved due to weather concerns to Sunday 31st March at Fisher FC, SE16 5EF. U7 White played well in tough conditions. Shape was good and in general a good application of what they’re learning in training. special mention to Daniel who produced 3 outstanding saves in goal and Rafi who bossed the game! U7 Blue were fantastic in producing an amazing comeback. The two keepers were men of the match and Ethan saved a penalty! Goals from Dylan and Oli got the Blues back into the game. U8 White had an all round excellent team performance dominating large parts of the game. Boys managed to play some great football and passed the ball around well. Fran had another very good game in goal and Benji showed great composure at the back. Goals from Taylor (4) Aaryan (3) Rafael (2) Man of the match performance from Taylor leaving their keeper with no chance from a free kick that went into the top corner. U8 Blue (pictured below) continued their great run of form with another hard working performance and showed great determination to come from behind and put a real foot hold on the game. Special mention for Jonah, Nathan and Ethan who all netted a brace while James marshalled the defence once again. Despite tricky conditions the boys displayed great passing and movement off the ball and produced another impressive performance. U9 White moved the ball around the pitch nicely first half against the blistering wind with Ethan finishing off a lovely move to take the lead. Second half playing with the wind proved much more difficult to control the ball and keep possession. On the back of a difficult few weeks the U9 Blue, we came out a different looking team. Difficult with the conditions but stuck to the game plan. Excellent passing, pressing, positioning and composure lead them comfortably into the break. Two goals from todays captain Toby which is pleasing to see after his ankle break a year ago to the day. Overall a great team performance which every player gave more than they could. Very positive and enjoyed by all the players today. Well done blues! U10 White learnt some good lessons today which the team took on board at half time. The boys gave a good reaction creating some good opportunities and implementing some elements of recent training. Christian showed a consistent performance. U11 White played a great game with goals from Ricco, Yannick and Peter. A calmly slotted goal from Ricco, a rebound shot off the keeper from Angelo’s freekick was tapped in by Yannick. A well worked goal ending with Peter smashing home from a tight angle. The team defended excellently against harsh wind conditions. Save of the season from Arkin saw him fingertip save a powerful shot onto the crossbar in the first half and then Ethan pulled off a great low powerful shot to deny the Edmonton striker. U16's played against AFC Hornchurch, one of the top U16 teams. In the first half the boys played the best football they have played all season and did not deserve to be 3-0 down at the break. Two errors and a 'worldie' accounted for the Hornchurch goals. The opposition's physicality gradually wore us down and the game finished 7-0 to Hornchurch. The effort level today from every player was exceptional. Special mention must go to central midfielder Matt who was outstanding. U15's had a tough encounter this afternoon against Aveley. After an even first half, 0-0 at the break, Aveley took a 2-0 lead before Zac pulled back with a great shot giving the GK no chance. Wingate pressed for the equaliser but were caught out conceding a third late on. Strong performances today from GK Jack, central defender Joe and right back Jonathan. U7 Blue played a frantic game this morning with 5 players on the score sheet. The goal of the game was from Jamie, and Oli took man of the match with a goal and great 10 minutes as keeper. U7 Whites played very well for most of the morning's game. The whole team had excellent shape and understanding of positions, with a special mention to Daniel as the Man of the Match. U8 Blues showed great spirit in the game! Jonah was the star man with an impressive hat-trick while Yash, James and Nathan showed great defensive displays to help the team. Passing was impressive once again and good movement off the ball helped the team continue their impressive season. U9 Blue played against a very strong Enfield side on Sunday who were very organised and composed. We maintained our shape and focus throughout the match and saw a couple of goals from Marc and Alessandro. U9 Whites had a great first half against London Lions with two goals for Max and one from Ethan. Good fighting spirit all round in awful weather conditions. U10 Blue played a really exciting encounter vs Enfield Town Youth. The boys got stronger as the game played and in the end the team were genuinely pleased with the performance. Great games all round but the Man of the Match, scoring 2 goals and showing great defensive play was Dylan. U10 White played some good possession football. All players contributed including some strong organisation and distribution from Zach in goal. Rafi (3), Jake (2), Olly (2), Reuben (1) and Joe (1) were on the scoresheet. U11 White played a brilliant away game with a great goal from Daniel in the first half after great build up play. Second half saw us against the wind which got stronger and stronger as the game went on. It was a great defensive display from the boys and some great last min saves from Ethan. Almost had a late goal when Angelo went through but was thwarted by a great last ditch tackle. Great energetic display by the boys. U12 had a good win against a good Edmonton side. All team members worked hard and got the result through intelligent teamwork. Scorers were Daniel (2) and Shin (1), and MOM Kacper and Alex. U14s had a game of two halves, they played some very good football in the first half, converting two of the many chances to lead at the break including a great free kick from Jake . The passing and movement was exceptional . The second half, we conceded 2 goals resulting in a 2-2 draw showing us areas to work on in training such as game management and to ensure concentration is maintained at all times, but a well deserved point in difficult conditions. A home game against HGS got the U18 Blue back to winning ways. Dominating play from kick off using the whole width of the pitch resulted in an emphatic 6-0 win with 2 goals each from Oliver and Jed and a goal each from Sam and a first goal of the season from Lotijan. Man of the match was Tommy who was excellent throughout the game. The Under 18's progressed to the London FA Final with an emphatic 5-0 win on Sunday over LOASC. The scorers were Jordan, Carlos, Abdou, with Rosley bagging a brace. The Blues will face either Barking or Bridon Ropes in the final. U8 Blues continued their incredible start to 2019 scoring an impressive 12 goals! Every player got on the scoresheet and the finishing was the best they have produced this season. Special mention to Zack and Ethan for their impressive displays and helping the team make it eight wins in a row. U9 Blue played to their usual self on Sunday. They showed great dominance and attitude to winning the ball every time it was with the opponents resulting in a very strong first half performance. U10 White didn't perform as a team to their usual standards today. However, there were some strong individual performances, most notably from Christian who showed good composure in possession and defended well. There were some well taken goals by Olly (4), Jake (2), Bailey (2) and Joe (1). U7 Blue have had three impressive games in a row, with another great team performance this weekend. Brandon has a great game between the sticks and Ethan put on his shooting boots. Very good passing from Jakey, Isaac and Ollie typified a strong team performance. U8 Blues enjoyed another memorable game as Ethan enjoyed his best performance of the season with an impressive hat-trick. Jonah continued his impressive goal scoring streak with two more goals while Nathan and Yash showed another side to their game with superb defensive display. Great movement off the ball and one touch passing helped the team made it seven wins in a row and a fantastic start to 2019. U9 Blue had a close game today, with standout performances from James grabbing an early goal. U10 White gave a proper team performance with good quality but with a fantastic spirit to overcome a strong opposition. There were well taken goals from Jake and Christian, while Ronnie and Bailey's performances typified a real team effort. The Under 14s displayed an absolutely brilliant performance from the 12 young men to overcome a very good team. Taking the lead three times but to be pegged back each time to finally take the lead for a fourth time to win 4-3 . Anton scored an impressive hat-trick and he provided the cross for Joe to also score a bullet header. Man of the match performance from Reuben and an overall great team effort! The EJA Under 15 side, managed by former player Tashan Bradshaw-Brown, reached the London County Cup Final on Sunday. The boys won on penalties, after thrilling 3-3 draw with Ryan FC. The scorers were Dan (2) and Luc. The boys will now play either White Star or Interwood in the final. The U16’s also had success, as they beat Buckhurst Hill 2-1 to reach the Quarter Final of the Chairman’s Cup. The next round will be against St Albans or Billericay Town. The scorers were Kieran and Matt. U7 Whites played really well. The birthday boy amongst the Wingate players was rewarded with a couple of goals. The passing and movement was good throughout with four players taking a turn in goal and a good level of positional rotation. Zack was the hat-trick hero for the U8 Blues. Great passing and movement throughout with another strong defensive display from James. Yash (2), Nathan (2), Jonah (2) and Samuel also got on the scoresheet. Under 9 White suffered a defeat but a strong performance from Cruz upfront and a fantastic display by Benji in goal were 2 positives to take away from a disappointing afternoon. U9 Blues came up against a strong opposition. A close first half could of gone either way but but a few early goals for the opposition put them in a commanding lead. We ended strong with Toby getting a goal back just before the final whistle. U10 Whites played one of their best attacking halves of the season, playing some good one and two touch football to go four goals up. A lack of focus together with some excellent team play by our opponents saw the deficit reduced to one by the end. The game was end to end with both teams adopting an attractive passing style. U7 Whites dominated their weekend fixture with some excellent inter play and fine individual performances from Luca and Harry. The whole team chipped in with at least a couple of goals each resounding in a fantastic display with plenty of goals. U7 Blues played a very hard fought game with a great performance from Jakey in goal whilst Ethan in defence really formed the bedrock of the team. U8 Blues continued their impressive start to 2019 with Samuel scoring a cracking goal. Jonah continued his impressive goal scoring streak with another well taken effort while Zack rounded off the scoring with a great finish. U9 Blues An all round great team performance was capped by a brilliant hattrick from Caleb. Charlie showed that his attacking abilities equal his defensive talent with a brilliant long range strike. U9s White saw a stand out performance from David in midfield - working tirelessly and showed great discipline in his all round play with some superb chasing down, marking, passing and interceptions. Max also showed great determination to get amongst the goals. The two U10 teams played each other. After a tight first half, the Whites finished as victors. Two well taken goals from Itai and a clever team goal finished by Olly were the stand outs. Reuben's distribution from the back continues to improve. For the Blues Dylan gave a solid and assured performance while Calvin's tackling and work rate from midfield was outstanding.